Our company is one of the leading PET Blowing Machine Manufacturers and Suppliers in Delhi. The PET Blowing Machine which we offer is featured with high strength, robust structure, and resistance to corrosion. 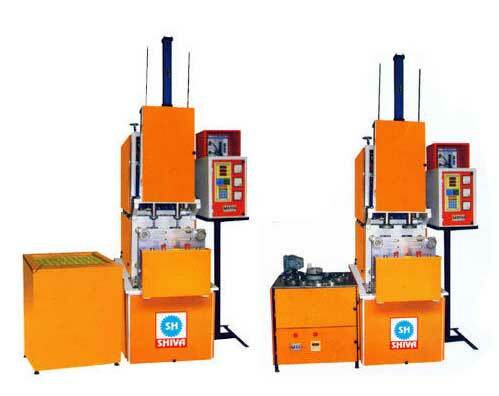 We offer high quality PET Blowing Machine which is available in two standard models. To cater to the exact requirement of the client, we can even customize the PET Blowing Machine. Easy & safe to operate, needs no skilled personnel. Production Per hrs. 500 pcs. - 700 pcs. 600 pcs. - 700 pcs. 1000 pcs. - 1200 pcs. 2000 pcs. - 2400 pcs. Operation Hydro-Penu. Hydro-Penu. Hydro-Penu. Hydro-Penu. Area Requirement 20 mtr. 25 mtr. 30 mtr. 35 mtr. Machine Weight 500 kg. Approx. 600 kg. Approx. 700 kg. Approx. 700 kg. Approx. Note : Semi Automatic PET Preform Stretch Blow Moulding Machine 500 ml - 25 ltr. Bottle 7 Jar.